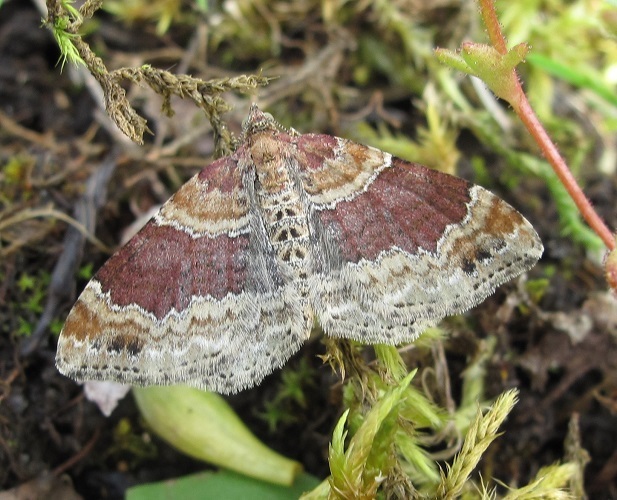 Like many moths the colours on the Red Twin-spot Carpet are very variable, but many individuals have a reddish tinge to the dark central band. An incomplete band on the outer wing ends in two prominent black dots - which give this species and several other relatives the Twin-spot Carpet name. Often found at rest and easily disturbed by day. Two generations, mid-April – June and late July – Aug.
Bedstraws, also Ground Ivy & Wild Carrot. Generally distributed throughout including gardens.